A few years ago, I started a small biotech company, which was awarded a DTI ‘Smart’ award for innovation. Finishing preparations for tonight’s debate on entrepreneurship. Having founded my own award-winning biotech company, I have a lot to say! 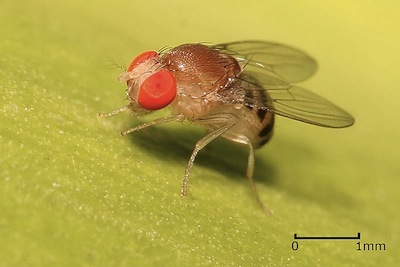 @teh_walrus it was a biotech company aiming to collect virgin female fruitflies! Trust me, this is an important task … and a big market! During 2005/6 the company was in the process of being struck off the register of companies. 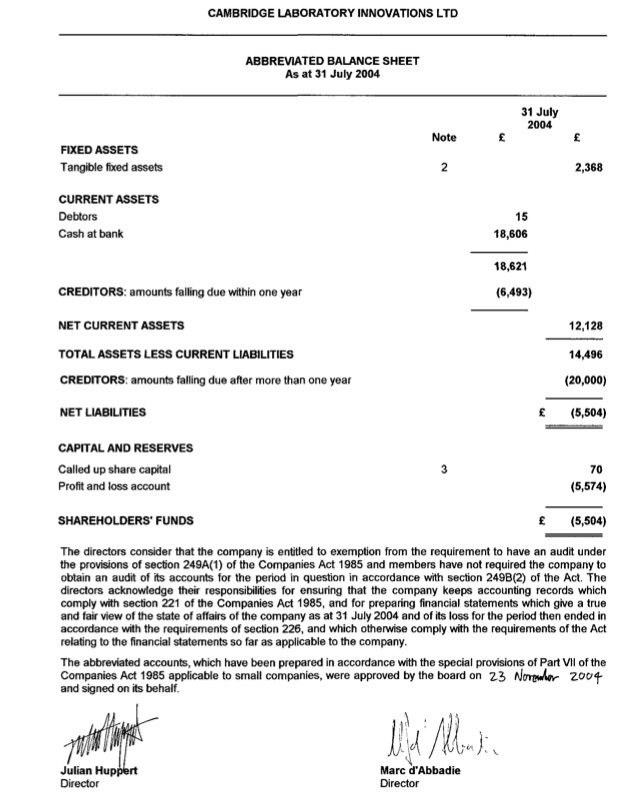 The company only filed one set of accounts, on 08/12/2004. 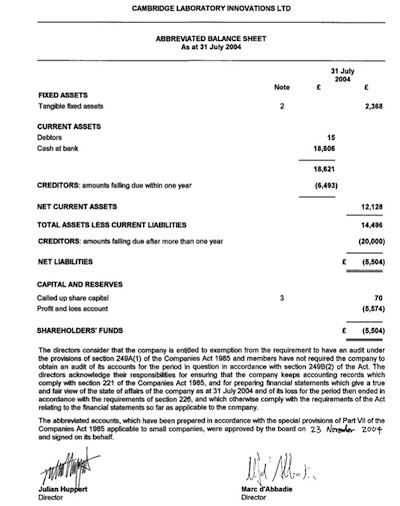 The company’s accounts are small companies’ accounts which mean they perfectly reasonably and legally don’t include full details; however they so include two items of interest: what appears to me to be a loan to the company of £20,000 and a loss on the profit loss account of £5,574. From the published information it looks like a very small enterprise, which wasn’t around very long (only operating for a year or so) and made a loss. I think it is excellent that Mr Huppert has had experience of running a company. If elected he will be able to draw on his experiences trying to work with the likes of the HMRC and Companies house and the current bureaucracy in general. While I’m publishing this article because I think its important for Cambridge electors to be able to see the scale, and degree of success, his business had; I don’t think we in Britain should be as culturally critical of failure as we are and we should look favourably on those who’ve taken a business idea on and tried to make a go of it (as long as they’re not irresponsible and don’t leave large debts behind). One thing I am very concerned about the tax rises in the Liberal Democrat manifesto published this week. One is a substantial hike in capital gains tax which would affect entrepreneurs like Huppert if they are looking to sell on their business. While the Lib Dems are trying to create a fairer tax system, and that’s something I support I think we have to be careful not to get rid of legitimate tax breaks which we currently do give people who start their own businesses, who generate wealth and create jobs. Some Lib Dems have been talking this week about clamping down on companies, trusts and other means the rich use to avoid tax; as they’ve been slipping “companies” in there I’m again worried that, as with capital gains tax, they might accidentally end up targeting the wrong people. Something I think we really have to do is take commercialisation of the UK university’s research outputs more seriously. While it doesn’t look at all as if Huppert’s company came into this category, we need to ensure academics are not creating companies merely to tick a “route to commercialisation” box on a research grant application. Universities across the UK need to provide much better support for commercialisation, and we need to ensure the profits made get recycled back into universities where they ought be providing a major funding stream. I’ve written more about this in my article on Higher Education Cuts. This entry was posted on April 16, 2010 by Richard Taylor. Hmm, not sure I agree with that last bit, Richard. Capital gains only affects shareholders, not the business itself. I think it is an important economic distinction to make – Corporation Tax is when companies pay tax on operating profits, capital gains is what shareholders pay when they sell shares at a profit (this does affect entrepreneurs who own their own companies, but should affect the profitability of the companies themselves). As for lumping business into the tax dodgers clan, this is undoubtedly the case, for some large multinationals at least. Look at the Guardian’s Tax Gap series from last summer ( http://www.guardian.co.uk/business/series/tax-gap ). Lib Dems are simply saying that if companies want to come up with some complex arrangement to protect investors from risk (holding companies etc) they are required to get the revenue to approve it first, rather than report it afterwards and hope they don’t get investigated, as happens at the moment. I like your investigative research here though, good work! Thanks for an interesting article. When it comes to small business and startups which are looking to be sold on capital gains is critically important. Entrepreneurs often start companies, prove the business model, and sell them on. These people will, accidentally, be penalised under the Lib Dem proposals. As part of a move to flatter taxation there will need to be a consideration of which “loopholes” are actually intentional and serve a purpose – such as those which encourage people to build businesses. I would rather such benefits were given more positively to entrepreneurs rather than existing as loopholes. The Lib Dem proposals are useful and helpful and in the right direction; they can be tweaked and turned into something great for Cambridge and which can support the UK’s economic recovery. So his experience seems to be in collecting a government grant, spending it and then closing down! Hardly the stuff of entrepreneurial endeavour! Dr Huppert’s company was probably one set up to exemplify some technology or research market sustainability. SMART awards are only made to companies so it couldn’t be done as a research grant. It’s entirely normal for such a company to make a loss and, if the project showed the business wasn’t feasible, entirely sensible to shut it down. Working in this field in the past decade, it’s quite normal to see an attrition rate for young research companies at this stage.